"Your careful attention to every detail of our most recent HAVE, Inc. order has resulted in another excellent set of eleven custom-made cable assemblies. An unexpected nice touch this time was the addition of a black covering over the silver colored body of the Canare F-10 RCA male connectors. Not only did this make the connectors less conspicuous, it will also eliminate a recurring problem we have had of the connector body parts unscrewing with repeated use. Over the years, we have continued to depend on the high quality of these HAVE, Inc. produced Canare cables assemblies for our live on-site recording of choirs and orchestras as well as vocal soloists. Thanks for your assistance once again." "Thank you for providing mic, instrument, speaker, and even organ output cords that have to be the best ever and over all these years have yet to experience even one failure. With so many users I just cringe at how they are abused because just a small percentage have any appreciation for the accessory hardware, let alone treat them like part of the instrument. Please continue to distribute the quality product you always have. "I want to thank you for your attention and detail in getting the cables to me on-time, also thanks for the color coding, I really appreciate it! The cables worked flawlessly! You are definitely on my list of vendors I will look to in the future!" "I got an email yesterday with the ups ground tracking, and the cables were delivered today. These cables look great. Thanks for working with me on this project and being able to deliver on my specific requirements." ”Your 16-channel coaxial cable is the greatest! As you know we have a hybrid analog /digital CCTV camera system so our special system rooms break out the analog cameras thru distribution amplifiers. Some of our rooms that are constantly growing with out expanding rack space are of course going to higher density. We used to cable with RG-59! This 59 cable would never fit in our applications so we had settled on using Belden 1855. After finding your 16-channel cable it was the perfect answer. It matches the counts on our encoders and our switch, imagine that. What took the industry so long to figure that out! 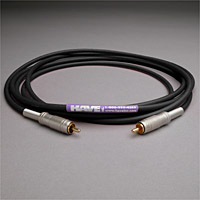 The 16-channel cable (HAVYR48327-1000F) lays up in the racks very cleanly and it is easier to install. Looks better too! The continuous cable markings are handy, avoid much confusion during installation, and easier to locate the spares we have laid in. 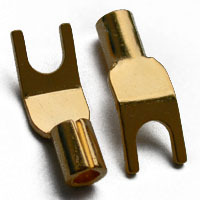 We were a little concerned in using any single piece BNC connectors. We have seen many one piece BNC's that were terrible, some used to just fall off. However after extensive testing for secure connections we have found that your HAVE HAVBNCFPSLC BNC's are more than acceptable. The have held up superbly. The speed and ease of terminations is a true cost saver in both time and manpower. We are happy that we have you on our team. Your customer service is fantastic, always cheerful and informative! Your past assistance with supplying our needs through our various contractors is exceptional! We will continue to utilize this cable on all of our future projects and recommend it to all of our contacts. "Thanks Fritz! I certainly wish that every business had a person like you to handle customer requests. Its a pleasure doing business with you.... have a great day." "I just rediscovered a pair of audio interconnects custom made by HAVE for me more than 10 years ago. These cables consist of Canare GS-6 wire beautifully terminated with Canare F-9 RCA plugs. After experimenting with "audiophile" cables in various systems over the years, I inserted the HAVE GS-6s into my system last week and heard the most balanced, musical presentation I've heard in quite some time. To put it mildly, I was surprised, having thoroughly bought into the audiophile mindset. I'd like to share this revelation with my brother and a friend or two but have no inclination to remove the GS-6s from my system. Consequently, would it be possible for HAVE to build for me two pairs of 3 ft. Canare GS-6 interconnects terminated with Canare F-9 RCA plugs?" "I love you, I love you, I love you. My wire got here yesterday and we were able to get a day jump-start on our project. Thanks so much for your help. I always try to acknowledge people who care and who take ownership of doing a great job for their customers. I know that I certainly do for my customers and am usually disappointed in my vendors who don't seem to care about my company. Thanks again, it is certain that you are incapable of mediocrity and I look forward to spending more money with you guys." This is more than just a cable with a physically intriguing and aesthetically pleasing design. When working with my ProTools systems, the flat-shaped, rugged, Flexygy cable integrates perfectly and sounds great! With its eight balanced channels, the Flexygy snake is transparent and has a dependable connection every time. I love the unique shape of this cable. The flat shape sets it apart from other cables and gives it instant "think different" value. Also, this particular shape has practical value- this cable could easily and unobtrusively be routed underneath a carpet, doorways or other tight spots. Unwinding the cable, it has a pronounced curly-q bend to it, which is quickly remedied by pulling the cable through entirely. I appreciate the 18" fan- this cable's eight channels can comfortably connect across a sixteen-channel console range. I found the 1/4" TRS connectors to be particularly smooth and solid. 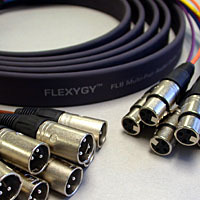 While the connectors of other cables sometime struggle to insert completely or don't easily achieve a complete connection, the Flexygy cable connectors are cooperatively smooth with the Digidesign I/O units. The audio signal never flickers or drops-out and the connections seem very solid. The sound is transparent. The signals are un-stifled- complete in their frequency range and unchanged in their proportions. There is no noticeable introduction of noise- the cables themselves do not impart color and I have not experienced external interference with the Flexygy shielded cable. Indeed, the awesome signal to noise ratio of the ProTools recording system is not compromised when using Flexygy cables. This is a great cable. Its unique flat design allows for covert operation in the studio and in live scenarios. Gaffers' tape is applied and removed easily- without the need for cable ramps with normal foot-traffic! The connection is solid and reliable. Dependability is a crucial prerequisite for every link in the audio chain- cables are no exception. The reliability of the Flexygy cable will help any engineer rest easy, knowing that their sound, whether in the studio or at the Super Bowl half-time, will not flash or flicker. The sound is transparent. These cables allow the user the sonic flexibility and openness to color the sound as they want- without bias to frequencies or distortion from the cables. Incidentally, in additional to the flat Flexygy, the manufacturer, HAVE, Inc., also offers a multitude of traditional-shaped cable configurations that are also top-notch performers. The cables arrived on time and worked great in surgery. I appreciate all your outstanding customer service. I'm the Front of House engineer for 2 touring bands, Rise Against, and Alexisonfire. We went to Australia in February, and I needed a couple of 8-pair audio snakes built while I was gone, since I've had no time to build my own. HAVE was the only company I've dealt with, willing to assist me quickly and courteously, being that I'm an independent engineer. I was treated the best by HAVE's customer service, and the Flexygy snakes were waiting for me when I stepped off the plane in Los Angeles to start another tour. I've taken my racks and gear along the West Coast, across the Midwest, the Southeast, and all of Eastern Canada. Nearly every club that has been able to accommodate my gear has asked me about my Flexygy flat 8-pair audio snakes. When I walked into my house job at Metro in Chicago, they also commented on the flat design. As a result, I've given your website info out to many engineers and techs. I chose the flat Flexygy design mostly because I was curious, but they have proven to be a good choice. We'll walk into clubs to play shows for 3000 people down to 500 people. The flat design gives me flexibility to maneuver the cables around consoles and gear in some of the more cramped quarters of smaller venues. I also don't get as nervous if a case gets placed on top of them. The flat design allows for an even weight distribution over the cables, unlike round snakes. That could be in my head, but it does make me feel safer. "Great website, excellent quality custom cable!! Great price too. I will come to you for my future custom cable needs." "I want to say that your company impressed me - from the on-line order to the help that I needed to get from you, to the actual items received. Everything was delivered on time and the quality was excellent. Thanks for the great customer service and technical support I needed!" "Easy and smooth transaction, helpful service, all Midi cables A+. Super quality work and follow-up by you good folks. I'll do busines with you again in the near future. Until then, all the best to you!" "I received the goods today and I am really over the moon. I was very impressed with the workmanship on the DB-25 cables. I showed the cables to two of my colleagues, one who is a very serious audio engineer at the University of Cape Town. He is generally very "particular" when it comes to matters of soldering and cable manufacture. He echoed some of my feelings - "Job Well Done". I really liked the look of the very clean shiny solder joints. But can never get the solder joints so shiny even though the joints are good. Can I buy rolls of the same kinds of solder from you? Thanks!" "I finished my project. I will be ordering from you from time to time as we upgrade our system. Your service was great, and the products I bought previously are fantastic. I've never had a vendor follow-up like this...it's very nice. Thanks." "Everyone is very pleased with the recording and the packaging. The CDs are selling like hotcakes! Thanks so much for all your help with this project. I'll be sure to encourage my next client to go to HAVE Inc."
"I had an excellent experience with HAVE, Inc. I will definitely order more from you when the need arises. Thanks for keeping in touch." "Thank you for your follow up. I've been very satisfied with HAVE Inc. I have a very small company and don't require a lot. But I guarantee you when I need more cabling and electronic components, I'll be in touch." "Thank you very much for the follow up. All the products that I ordered arrived in a very timely manner and were as described. I will definitely be doing more business with HAVE, Inc. in the future. And my new company will more than likely be doing business with your company also." "I'm back from vacation and I got the cable. It's absolutely perfect, you are amazing"
"Our incoming phone lines were down earlier this week due to severe thunderstorms in our area. Thank you for following up on my order, that kind of customer service is so hard to find these days, and I appreciate the gesture. We received the order on time - actually it arrived a day earlier than expected. Thanks again for coming through for me in a pinch." "The Mogami 2490 cable showed up over the weekend and I've been meaning to thank you for the great service. I belong to a microphone hobbyist users group and members are constantly asking where they can find thin mic cable to build 'stealth' condenser mics. I hope you don't mind me passing along HAVE, Inc as a source for cable and connectors. Until the next order, Aloha!!!" "Broadcast Sports would like to express our extreme satisfaction and Thank You (to HAVE Inc.) on a job well done. Your team has demonstrated Customer Satisfaction is 'Job 1'." "I received my order yesterday. Thanks for the great service. I did not expect to see it for another three weeks due to the connector backorder. Thanks for all your help. The speaker cables are exactly what I needed." "HAVE made twelve 8 channel snakes for my 48 track RADAR system. They did a great job. They were very careful to get the details right and they were helpful on the phone. They got it done quickly too. Im very happy." "I write to commend you and the staff of HAVE, Inc. for your work on our Audio Teaching Resource CD project. The level of your customer service was truly exceptional during every step of the process. You helped us make design decisions, were timely in the execution of CD duplication, and when an error occurred in the finished product you fixed that error without hesitation. The finished CDs are well made both in appearance and sound quality. We wanted to let you know that an exceptional product and superior customer relations are the reasons we will choose HAVE, Inc. in the future. Thank you." "I am happy with the [duplication] job you did on the Qigong and Tai Chi videos. I like the communication we have had. Thanks. I anticipate ordering more copies within the next year. We'll be in touch." "Hey, you guys are the best! The tapes got here and I just popped one in and it looks great! I can't believe you guys turned that many around that fast and then got them here so quickly; after getting the master on Monday, you got them back in our hands by 3:30 on Tuesday! But you did it and I just had to write and say thank you. You guys pulled through again for us. I hate to keep testing that, and hopefully that will stop, but you came through again and I thank you and appreciate it. You never get rattled, even when things are coming unraveled for a client...and we all know that my or any other clients problem becomes HAVE's problem. You and everyone at HAVE are the standard by which Customer Service should be judged. Thank you all again!" "When I design wiring diagrams for non-linear systems, I go at it from the perspective of someone who has struggled, and watched trained professionals struggle, with setting up rental systems. I've seen technicians take up to 90 minutes to set up a rental Avid system without a proper wiring harness, but systems with the HAVE harnesses I've designed are typically ready to boot within 15 minutes of arrival, and they don't require highly trained technicians for assembly. I work for simplicity in my designs, and not everyone understands that to make something simple takes a lot of thought and very careful construction. HAVE appreciates my approach and builds harnesses that are tough, clearly labeled, and easy on the eyes. They look good and make me look good to my clients." "We got the CDs this morning...they look fantastic! Thanks so much for all your work helping us get this project completed (and in such a short amount of time). We really appreciate it a whole lot. It's been a pleasure working with you." "Thanks once again for the superb customer service and lightning fast delivery of my cable order. Thank the folks in your cable shop for their excellent work." "Thanks for the super quick delivery and accurate service! All parts were accurate as ordered...couldn't ask for better service! In a few weeks I will be ordering some additional canare boots, RCA connectors and F-Connectors." "We received our HAVE, Inc. CD shipment on Friday and completed our CD mailing before the weekend. Thank you so much for all your support!!! The CD's look great. Our Pete Seeger Remembers was very successful and we are grateful for the quick turn around that you provided to us for the Fall Fund Drive CD premiums. Our listeners will be very glad to have their gifts in hand. Thank you again, on behalf of everyone here at WAMC; I send our warmest wishes to you and the folks at HAVE, Inc."
"Everything was amazing, great cables, and your service was fabulous, thanks a lot. I'm one happy customer, and will be using HAVE, Inc. for future purchases, and will definitely spread the word about you. Thanks again..."
"I received my RGB cable today, hooked it up, the performance is fantastic! I've got some friends in the home theater design/installation business and I'll be recommending HAVE cables to them. Fantastic performance, no snake oil, great price! Thanks!" "I am really HAPPY with the Flexygy 2-conductor cables. They are the best sounding to date, that I have used in my studio... (Mogami, Canare, Monster, ProCo, Redco, Hosa, none compare to the Flexygy 2-conductor). I find the Flexygy to have a clearer image, no distortion, the low end is very balanced, and the highs are smooth. Thanks for recommending this cable, and for the expedient delivery of the cables." "I received my order quickly and in great condition. I was very pleased to find your website and with your service and for what it's worth I'm telling my friends and associates about your site. Thank you." "I use my flat Flexygy snakes in a recording studio environment, mostly for temporary hook-ups, but I'm going to be using some for a permanent install as well. They lay unobtrusively on the floor, and we use one to go under a door in the studio, that closes. Everyone likes the look of the flat cable a lot!" "Just a note to say how much I appreciate your attention for this small order. I am very pleased with the spade lugs, both the SPADE 90 and the HDS5's. Please relay my thanks to your team at HAVE Inc."
"Thanks for the follow-up. We are very pleased with your pricing and speedy shipping. We look forward to using you for future projects.... Thank you and happy new year."